Swansea City's first match since their US takeover saw them comfortably beat League One Bristol Rovers. The Premier League club confirmed their takeover this week with the American investors purchasing 68% of the club. 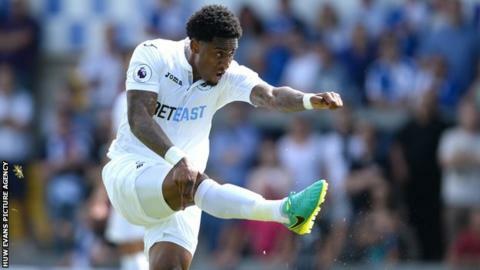 The players responded decisively, leading 4-0 at half time through Andre Ayew, Leroy Fer, Stephen Kingsley and Kyle Naughton goals. Substitute Luke James scored a consolation before Wayne Routledge made it five after the interval. None of the Swansea players involved in Euro 2016 featured at the Memorial Stadium. Nonetheless the Premier League side showed their qualities in a one-sided first half, scoring three times without reply within 18 minutes. Andre Ayew's peach of a freekick was the pick of the bunch, curling home over the wall from 25-yards out. Netherlands international Leroy Fer scored a classy second as he strolled through the Rovers' defence and slotted home, before Stephen Kingsley's slightly deflected cross caught out goalkeeper Steve Mildenhall. Swansea were dominant in possession, but squandered chances to increase their advantage before the break. Nathan Dyer, a Premier League winner last season while on loan at Leicester City, was the worst culprit before he combined to release Naughton, who slammed home in first half stoppage time. The hosts made a number of personnel changes at the break and improved, James slotting under Kristoffer Nordfelt, before Routledge raced clear to add gloss to the finish.